We did a LOT of puzzles with the girls when they were small. They’re good for a whole bunch of reasons: developing hand/eye coordination, fine motor development, problem solving. We had some fun ones too; puzzles that glowed in the dark and had “heat spots” that revealed hidden pictures underneath if you pressed your hand on them. My MIL has been a big fan of puzzles ever since I’ve known her. I’ve been slow to come around, because the idea of assembling 1000 tiny pieces into one big picture all by my lonesome never held much appeal before now. Perhaps puzzle interest develops with age, but I’m starting to see the appeal of puzzles, especially if there are other people around who are willing to help. Assembling a puzzle is an oddly meditative, isn’t it? Looking at the pieces and mulling each one over… it forces you to slow down and focus. I imagine it’s good for grown up brains too. Cool eh? It’s a WHOLE NEW GENERATION OF PUZZLE! What do you think? 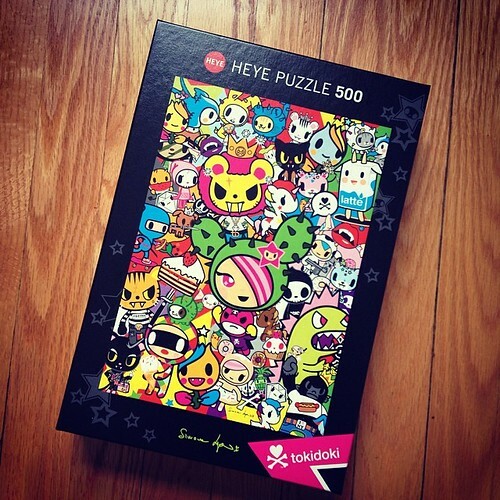 Is it time to bring back puzzles? Or were they always here and I just never noticed? Share the post "Are you a puzzle person?" 6 Responses to "Are you a puzzle person?" Not really a puzzle person but making an under the couch table such as you describe would be very easy. IKEA sells table tops & wheels (you just put together). For that matter, all you really need is a hunk of wood and wheels (which you can get from Home Depot or similar as well). Just screw the wheels onto the bottom of the wood. For bonus points I’d cover the wood with felt (fabric store, use a stapler) so pieces don’t slide around. I’m a huge puzzler! I actually asked for 500 and 1000 piece puzzles for Christmas this year and got some lovely Ravensburger puzzles (really great quality). My older two were never big into puzzles but luckily for me my youngest is – so it’s something we can (and do!) do together. I agree with you – there’s something so peaceful and calming about it – plus the huge satisfaction of putting in the last piece! Mary – I am seriously considering taking the DIY route. I like your suggestion of adding a felt covering. Smart! FWIW, we have a board covered with flannel (doubles as a felt board for the kids). I find that the pieces stick a bit too much and it can be hard to slide the pieces into place, or move sections of puzzle around. I would still cover a board with fabric, but using a smoother fabric. If you go with a too smooth fabric you might find pieces flying off the edges when you move the table. Perhaps a tiny lip on the edge would prevent problems. Heck even just a border created with felt glued to the fabric might do the trick. of course there are those roll up fabric mats for making puzzles on too. Then you just need to occasionally clear a table surface to work on, but the puzzle can be rolled up and set aside at meal times.